Large Cabin Rentals makes planning a large group vacation in the Smoky Mountains easy for families, church retreats and business getaways. Large Cabin Rentals helps groups plan the perfect large group vacations in the Smoky Mountains. With LargeCabinRentals.com, we wanted to create something to take the hassle out of vacation planning by providing a single space where visitors can find everything they need to plan a memorable trip with their friends and families. Tired of struggling to find a Pigeon Forge or Gatlinburg cabin rental that can accommodate a large group vacation in the Smoky Mountains? Look no further than LargeCabinRentals.com. Brand new to the Smoky Mountain cabin industry, Large Cabin Rentals is the ultimate resource for vacationers planning a church retreat, business getaway, family reunion or wedding in the heart of the Smoky Mountains. With the new site, visitors can find everything to plan the perfect large group vacation in the Smoky Mountains. Features on Large Cabin Rentals’ website include a full list of the company’s inventory with availability, lodging tips based on vacation type, information on all the fun things to do in the Smoky Mountains. There is also a contact form that group vacation planners can use to ask the company’s team of vacation experts any questions they might have. The Smoky Mountain cabins included within Large Cabin Rentals’ inventory can welcome groups of any size. These rentals range from a spacious 8 bedroom cabin in Pigeon Forge all the way to a huge 16 bedroom Pigeon Forge cabin that can hold up to 74 guests at a time. In addition to their space and comfort, the Pigeon Forge cabins offered by Large Cabin Rentals provide a variety of luxurious amenities that can only be found with this Smoky Mountain cabin company, including their 8 bedroom Pigeon Forge cabin rentals with an 18-hole mini golf course in the lower level. 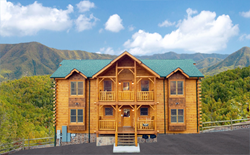 True to its name, Large Cabin Rentals specializes in providing families and guests the most luxurious custom-built large Pigeon Forge and Gatlinburg cabin rentals in the Smoky Mountains. Ideal for family reunions, church getaways, business retreats and Smoky Mountain weddings, these cabins can accommodate group sizes of more than 70 guests under the same roof, and upwards of 400 guests in the same area. All offices are located at 702 Wears Valley Road, Pigeon Forge, Tenn., and are open Monday- Friday 9 a.m.- 9 p.m. and Saturday-Sunday 9 a.m.- 8 p.m. For additional information, or to reserve a cabin, visit their website at http://www.largecabinrentals.com, or contact them by phone at 1-877-544-9594. 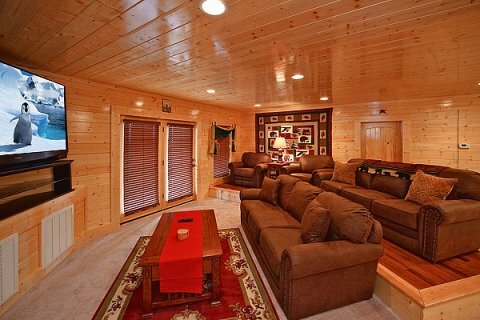 Each of the large Pigeon Forge cabin rentals found on Large Cabin Rentals' inventory come equipped with spacious home theater rooms and gorgeous mountain views.